Antoni Gaudí was a man of great pride, great creativity, great spirituality and great nationalism. A fervent supporter of the Catalán state until his death, Gaudí's mark on the world extended beyond the magnificent buildings he designed. Gaudí was born in Reus in 1852. Reus was a small town outside of Tarragona, about an hour and a half from Barcelona. The future architect's love for nature emerged out of a childhood wracked with the pain of rheumatoid arthritis. Gaudí's mother took him for trips into the Tarragona countryside, as she believed that a little exercise and fresh air would help him combat his illness. Amid the rolling hills and fields of almond trees, Gaudi's eyes awoke to the elegance and harmony of nature. He finished his secondary schooling in Barcelona, where he continued his education at a Barcelona university (Escola Tècnica Superior d'Arquitectura de Barcelona). Like any starving student, Gaudí used his abilities to earn cash to pay for school. He befriended local architects and businessmen, who in turn hired him for odd jobs and apprentice work. The budding genius graduated from university in 1878. That year, he landed his first and only public contract, the result of which – a series of iron-laden lampposts – still stand in the Gothic Quarter's Plaza Reial. That same year, he befriended Eusebi Güell, a wealthy Barcelona businessman who proved to be Gaudí's most generous and most enthusiastic supporter. 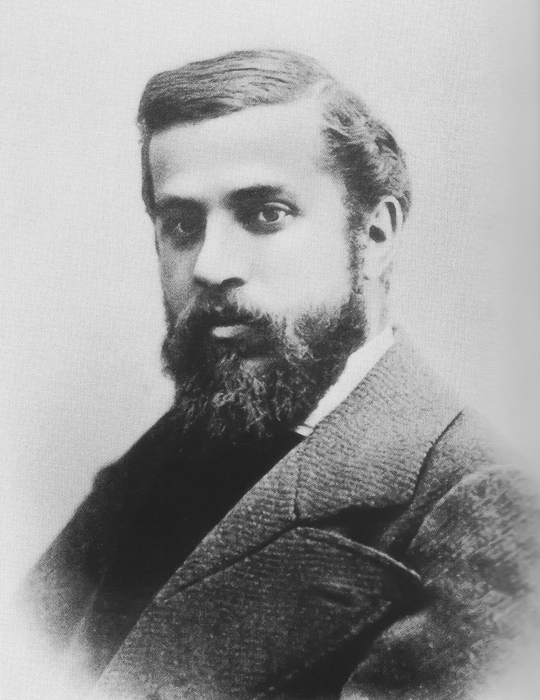 Gaudí's career skyrocketed after university. During a span of about 10 years, he designed a variety of structures, from a palace pavilion specifically built for a king to a stable for one of Güell's properties. Gaudí's work didn't let up as the decades passed. He designed buildings in Barcelona and beyond, completed La Pedrera and Casa Batlló, and started construction on a series of new buildings for Eusebi Güell. In 1914, after the death of his father and his close associate (not to mention a bout with Maltese fever), Gaudí devoted his time exclusively to La Sagrada Familia. He accepted no payments for his service to the church. 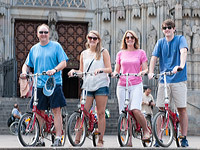 The Sagrada Familia is, in many ways, the shining example of Gaudí's growth as an architect and artist. The temple's intricate design and overall grandeur represent the climax of the Catalán genius' maturation and creativity. Intertwined amid the spectacular columns, colors and forms of the church is the influence of the natural world which Gaudí fell in love with as a child. 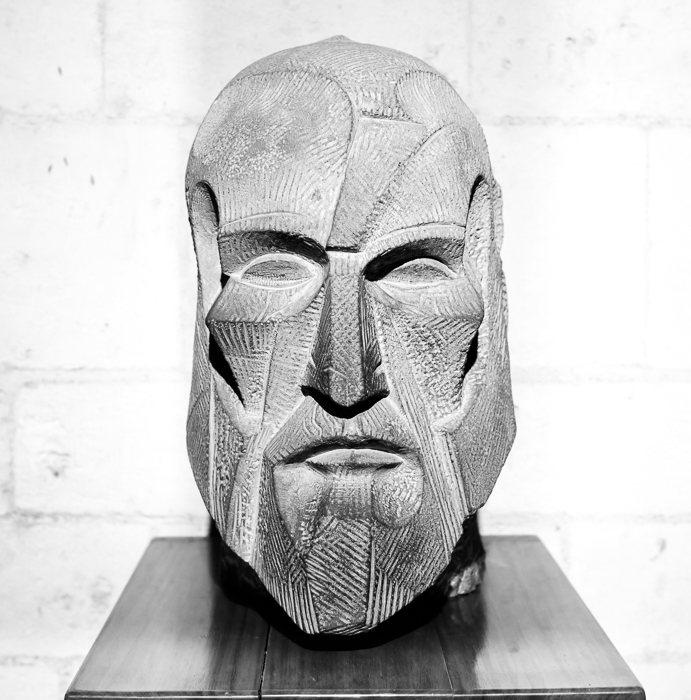 More than forty years after beginning Sagrada Familia, Gaudi's life came to an abrupt end. On June 7, 1926, he was walking through the city. He crossed a street, unaware a tram was approaching. The tram hit Gaudí. Two days later, he died in a hospital for the poor. Mourners laid his body to rest in a crypt at the Sagrada Familia, a fitting gesture for the architect who drew so much inspiration for his church through the natural settings of his beloved Catalonia. For most of the world, Gaudí's works are what define him. Wild color combinations. Imaginative shapes. Fantastic forms. Often missing from our Gaudí knowledge, however, is the motivation behind the colors, shapes and forms. He incorporated Catalonia's natural beauty and rich history into his objects. As he prepared to design light posts for the city's squares, he wrote: "The most significant element as far as decoration is concerned, is the ending of the supporting piece which is shaped in a way that it conveys the traditional history of Barcelona." Gaudí was proud of his Catalán heritage. When foreign dignitaries met with Gaudí, the architect would only speak Catalán. His pride in the Catalán people offended some, while it gained the respect of others. History proved, Gaudí said, that Spain owed significant parts of its daily life to Catalonia - particularly the Spanish flag, the Spanish currency and many Castilian words. The famed architect also was heavily involved in politics. He held strong opinions about Catalonia, Spain and political theory. Gaudí was a devout man. He went to church twice a day. He believed with conviction his architectural ability was a gift from God, and that his pursuit of excellence in his field benefitted his city and his beloved Catalonia. "Social excellence can be achieved when everyone uses their own God-given gift," he said. "I work for Catalonia from my own field. That is, I build a Temple because it is the worthiest building to stand for the people of any country." His fierce dedication to a proud, self-sufficient Catalonia that fought for its heritage and inherent beauty lives on in La Sagrada Familia; which, like the Catalán spirit Gaudí adored, steadily rises skyward, fighting for its future through the generosity of its supporters. Early on in the construction of the temple, Spain's King Alfonso XIII walked with Gaudí on a tour of the cathedral. After a discussion about the church's dimensions, the king asked, "Why such height?" Gaudí replied, "Because on erecting it, with its cross at the very top, we would like to kiss heaven." "In order to walk properly, one needs both legs, and does not lift one leg until the other is placed safely. Otherwise, we would jump precariously and we would fall down, instead of walking in a steady way. That is why in politics, opposition is absolutely necessary." "Enlightened or not, a dictatorship cannot last because it is useful only temporarily. A dictatorship is like a bridge between two ways of ruling. And people do not dwell on bridges, they only walk across them." "The politician must have two essential attributes: a great enthusiasm for public matters and a great strength of will to control and rightly direct such eagerness." "Language conveys thought minutely. Only one's mother tongue can rightly express those spiritual matters which are higher above than everyday concerns. When a speaker uses a different Language, he has to resort to the listener's imagination and thus the concepts lose their wholeness. One could express an idea in a foreign language but its spirit will be missing." "Those who look for the laws of Nature as a support for their new works collaborate with the creator." "Anything created by human beings is already in the great book of nature." Gaudís portfolio of projects is a diverse collection of the grand and the modest. Take a look below for brief descriptions about his major, most important, works. Many of Gaudi's minor works took place outside of Barcelona. Read below for information about some of the great architect's lesser-known projects. 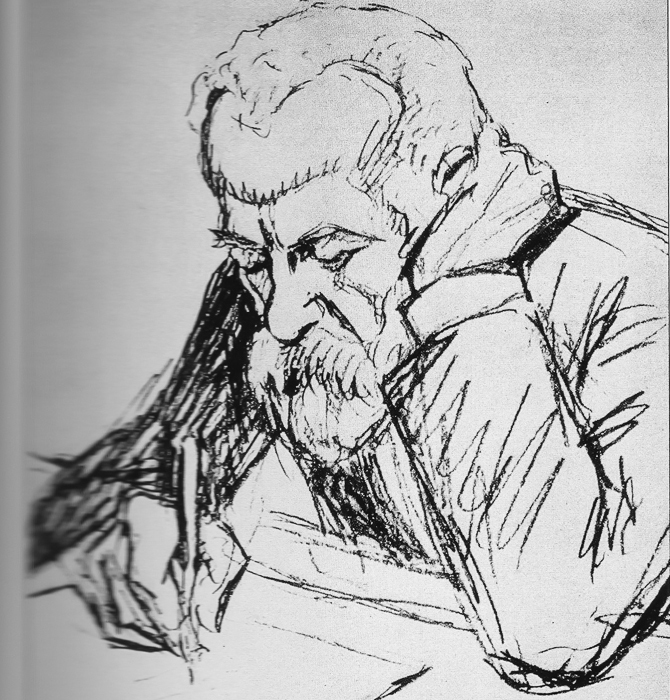 A sketch (by Ricardo Obispo) of an older Atoni Gaudi working in his studio at the Sagrada Familia.